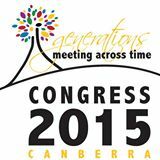 Hot off the press is this news from the Congress 2015 Convenor. If you needed any more incentive to get your registration done sooner rather than later, here it is. Email by 2 December 2014 (by midnight, Sydney time) to congress@hagsoc.org.au indicating your preference/s. National Archives of Australia: 5-7pm on Thursday 26th March for a maximum of 15 people. Everyone who is registered for Congress by midnight (Sydney time) 30 November 2014 will be eligible to enter the ballot. Entries will need to be received by midnight (Sydney time) on 2 December. Successful entrants will be notified as soon as possible after that time. Each of the institutions has some additional information about making the most of these research opportunities. The additional information will be sent to those successful in the ballot. Family asking what you would like for Christmas? Perhaps they could give you a Congress Registration, a ticket to the Welcome function or the dinner or a copy of Congress proceedings. And there are certain to be some ‘must haves’ among the goodies that our exhibitors will have on display. I do hope you’re going Alex 🙂 We’d all miss you if not.